Education about education in Congo | Walk with us! Fr. 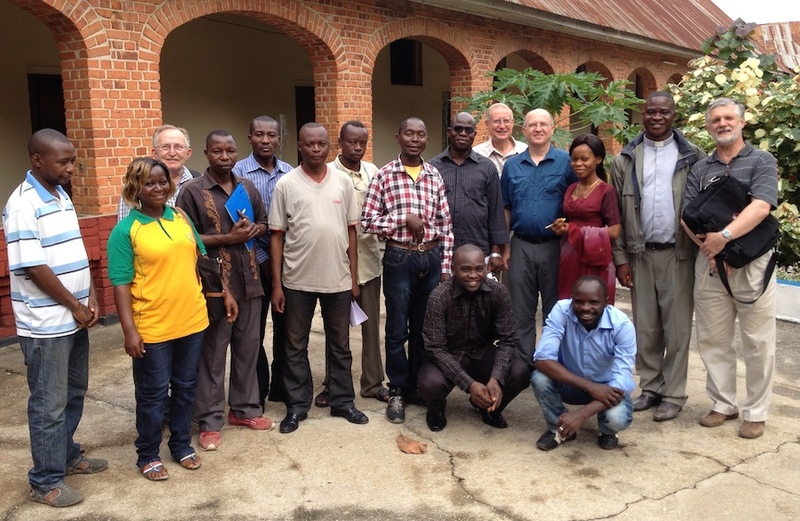 Charles Brown shared the photo above of SCJs with diocesan radio and television personnel in Kisangani. The US Province helps to financially support the broadcast center whose task is “evangelization and social development.” Fr. Steve was interviewed on television during his visit. Friday, November 28 – The SCJ visitors from Poland and Cameroon returned home yesterday and we welcomed two new members from the North Italian Province, Frs. Nerio and Daniele to our tour group. They flew into Uganda and took part in the events of the eastern part of the Congo before working their way to Kisangani to meet up with us here. Visiting the minor seminary for the archdiocese brought back many memories for Fr. Nerio, who had lived there himself when it was an SCJ institution. We saw workers harvesting clusters of walnut-sized pods from palm trees to press and boil and make palm oil. Rather than a kitchen, the cooking area was outside in the courtyard. Blankets spread in the sun held drying manioc. The dormitory was one long room with beds covered in mosquito netting lined up one after another. Many of the buildings were in need of repair. The oldest original structure actually lay in ruins, destroyed in the 1964 rebellion and never rebuilt. But inside the classrooms where we met the students I encountered life and hope and energy. Their system of six years of secondary school would be the equivalent of our junior and senior high school together under one roof, so when we visited the first classroom I was struck by how young that group was. Just as in the States, when boys begin that young, only a small percentage will end up becoming priests. In their time of studies they will get a good education. Hopefully those who go one to other careers will become faithful Christians who will bring to those values to their families and society as a whole. 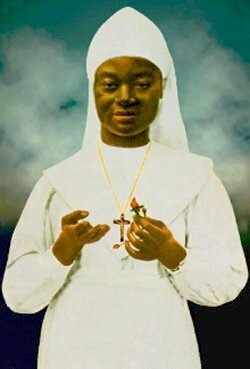 Every church we’ve seen has a prominently displayed a picture of Sr. Anuarite, a Congolese nun who was martyred in the 1964 rebellion. She has incredible respect and admiration from the people and many societies of prayer and good works have been organized in her memory. Fr. Claude, who worked for the diocese during his mission years here, was one of the interviewers when the Vatican investigated her cause. He actually interviewed the rebel officer who killed her when she refused to submit to him sexually. How would I have felt and acted to come face to face with one who killed someone I so admired? We visited a high school. One of the or English students asked me to explain why we have two different ways to pronounce the word “the” but I was no help there. Neither could I help when I noticed that instead of textbooks the students had just copybooks. The teacher asked if there was any way we could help with books and materials. A complex problem we discussed on the way home is that illiteracy is very high in this part of the world. Books are both expensive and in short supply. Any items shipped into the interior take a long time to travel upriver, and without being guarded have a good chance of being stolen along the way. I asked about printing locally, but while there is a vast amount of wood, their are no paper mills. In this city of 1 million there is not even a daily newspaper. The problem is similar in most any poor area of the world, and even my experience in the States. How can you gradually and effectively help a struggling local economy build the resources and infrastructure to meet its real needs? Responding to health care needs the SCJs helped built a hospital some years ago. The surgery room looked like the set of a 1940 movie: six hospital beds to a room with no curtains or partitions. Families cooked meals on open fires at the property edge to feed their sick relatives. An ambulance with one missing tire rested on a concrete block. Bed sheets dried on the lawn. Nurses entered patient data by pen into a ledger book. Dedicated staff struggled with limited resources. The need is great and as the sick come to the door, they do what they can. After the Six Day War in 2000, Fr. Zenon and other professionals of good will collaborated to develop an organization to give youth hope for a better future: GRADI Juenes (Group Reflection Action Development Integral for Youth). They volunteer their time to present programs, retreats, activities and even radio programs to help the youth in character and moral development. A starting point is a strong message of anti-corruption. They steer the youth away from getting caught up in the downward spiral of prostitution. Counseling is offered at the drop-in center. They reach hundreds of youth each month, and do it on a shoestring budget of about $1,250 per month. They expressed gratitude for our financial help. Again I was edified by the collaboration, commitment and hope. Across the alley is a kindergarten that the SCJs sponsor. School was closed for the day. I reflected on the brightly colored mural of Jesus looking over a crowd of Congolese children. Many of the buildings in the city could use a touch up. Paint seems like a luxury when there are more basic needs. Yet beauty and inspiration ARE a basic need. Saturday, November 29 – RTA is the Radio and Television network for the Archdiocese of Kisangani. They invited us to tour the facilities and see how they use the media for both evangelization and development of the people. One of the technicians showed us the rough edit of last Sunday’s commemorative mass for the martyrs. Frs. 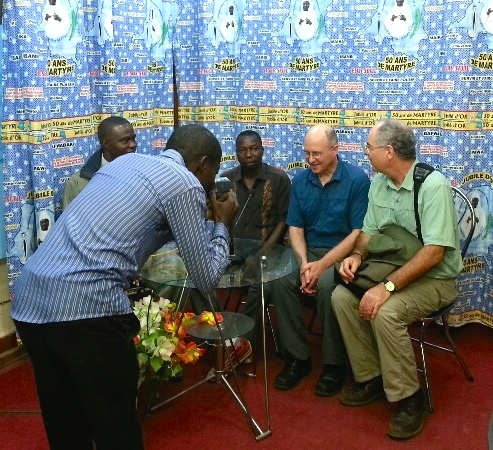 Steve and Charlie were interviewed in Kisangani. The main purpose of the visit was a “press conference”. A while back the SCJs gave a mission grant that helped keep them going through a critical time. I felt awkward when I found myself the center of attention and appreciation being thanked for something set in motion before I was provincial and the details of which I knew so little about. I mentioned that it is really our donors who deserve the thanks. We are only stewards of what they give us. They tell us to spread God’s love and use their donation where the need is great and it will do the most good. I thanked the staff for their dedication and hard work and told them I have seen good results and can assure our donors they have brought about great good. We went to the production room and sat down for a short interview. Fr. Charles Brown graciously served as my interpreter. I spoke of what being here at the commemoration of the martyrs has meant to me, and offered some words of encouragement to the youth of the diocese. Fr. Claude Bédard then took his turn at the mike and had them laughing as he recounted some of his adventures from coming home after 30 years. As a gift I received a lovely statue of Mary holding Jesus, carved in local ebony. Mary is the patron of the diocese, and they spoke of how the gift symbolized the connections between our peoples. Our house for initial formation was rather quiet when we arrived. The new group of a dozen seminarians won’t start their program until February, but vocations are strong for us right now in Congo. This part of the world has very limited banking and financial infrastructure. To try to establish some long-term financial viability the religious congregations try to invest what they have in land or buildings they can rent. Next to the house was some land the community wants to develop, and we saw the beginnings of a series of brick stalls where locals will be able to sell produce and wares. They joked that it was a local version of a strip mall! We toured the Sotexki fabric plant to get an idea of the state of area industry. It is one of the multinationals still operating here, but in a much smaller capacity than in its heyday. Where once thousands of workers spun cotton into fabric, now the work is carried on by 200 or less. There are very few of these kinds of jobs for youth looking for employment. I was grateful to a return to the good old fashioned comfort food I love so much. Fr. Giovanni is a missionary from Italy who knows how to make it right. He talked to a friend who owns a restaurant, borrowed his kitchen and ovens, donned a chef’s cap and baked us a feast as we sat in the (relative) cool of the evening and leisurely gabbed.